If a truck-load of kale was delivered to a regular Toronto restaurant chef, it would be next to impossible for them to sell enough salads to exhaust their inventory, but that’s exactly what chefs at a local Toronto women’s drop-in centre do every week. 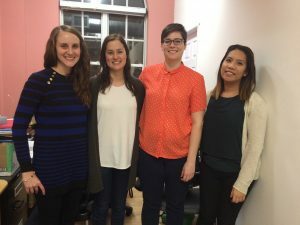 To help chefs at Sistering drop-in centre, who serve up to 250 meals each day to women who are homeless, under-housed, low income or marginalized, DLSPH Nutrition and Dietetics students created a menu planning tool that meets the daily nutrition needs of its clients with available donated items. “One of the biggest constraints faced by charitable food programs and organizations is the limited nutrient-dense food that they are able to provide for their clients due to inadequate resources,” said Courtney McAskile, a second-year MPH candidate in DLSPH’s Nutrition and Dietetics program. She worked with fellow students Hazel Fernandez, Sarah Kassel, Etienne Nemanishen, and Sistering to create the tool. Homeless women experience low energy intake and have diets that are low in fruits, vegetables, and dairy products, but the team was surprised to learn that many people who consume meals at shelters and drop-in centres like Sistering experience chronic diseases, like diabetes and hypertension. The reason, the team wrote, is that although the organizations may have the best intentions, budgetary shortfalls and the inability to choose which foods are donated may result in the provision of foods that are high in cholesterol, total fat, saturated fat and added sugars. The team worked in partnership with Sistering’s chefs, administrators, volunteers and clients in the fall of 2016 to create a menu planning tool for chefs that identified how to use existing and new recipes in combination with other foods to create a balanced meal according to the Toronto Public Health plate model for drop-ins, a visual way to think about food group portions. According to the model, half the plate should include vegetables or fruit, a quarter of the plate should be grains, and a quarter of the plate should consist of meat and alternatives. This plate model aims to include all essential nutrients in one meal, as drop-in clients may only eat one meal a day. “We organized the tool by food group, but also by commonly donated foods, such as carrots, squash, or kale. This way, if chefs receive a large shipment of squash or kale, but don’t know what recipe to prepare in order to use up the shipment, they could easily flip to that section and find a number of recipes making use of this ingredient,” said McAskile. Since delivering the tool to Sistering in November 2016, the team has been approached to replicate the resource for the clients at 29 more drop-in centres in Toronto. “Food insecurity resulting from precarious housing is an important issue for many Torontonians,” said Donald Cole, Professor of Epidemiology and Clinical Public Health at the DLSPH.